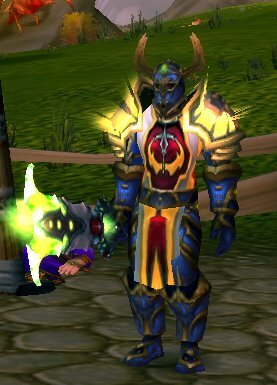 I'm just kidding the respec isn't so bad, in fact you could do without it if youSo WOTLK comes out tomorrow. For some people that means they'll be playing from Midnight to dawn. For folks with family and work (like myself). I'll be lucky to have it fully installed and get an hour or two of play time Thursday night. Sanctified Wrath - Now with the forbearance change I prefer to have a bubble available most of the time anyway, these points can move somewhere else. I'd like to preface that this is a bit subjective. You may allocate your points differently if you'll be doing a a lot of groups, dungeons, etc.... I expect the majority of my time to be soloing with limited groups. Divine Purpose - Let's face it, the reason this talent is picked up is for the extra stun resist. With the Human Racial ability changed to a stun resist ability I can let this and my Medallion of the Alliance go. Vindication - This procs a lot, vindication is just about always up within a few seconds of attacking, it should help with almost every mob. Improved Ret Aura - My "recount" add-in broke down the numbers and it turns out that regular Ret Aura seems to total between 5-6% of my overall damage in PvP getting the improved version should increase my overall damage an extra 2.5-3%, maybe more because I don't always have Ret aura on in PvP (going against a frost mage, shadow priest, etc). I expect to have Ret aura on all the time when grinding. Well there you go. I haven't Specced for PvE in months, so any comments/suggestions are welcome. That's pretty much what I'll be running too. Something to consider though is that 2-Handed Weapon Specialisation only affects weapon swings for 2% per point (so not Judgements, Consecration or Ret Aura). Crusade however affects all damage for up-to 2%, and most mobs you'll be killing in HF or BT are of the requisite types. If you are choosing between one or the other then Crusade is probably better. Also, mob health in WotLK isn't that much higher than TBC, and I find that Vindication pretty much eats the damage of the attack which proc'd it. Great for Prot or Holy Levelling, not so much for Ret in my experience. If you're going to be doing a lot of instances then I'd definitely take Vindication, otherwise it can probably go on a lower priority. I'm not quite clear on what you mean by "I find that Vindication pretty much eats the damage of the attack which proc'd it."? Could you elaborate on that? Shouldn't it just be a straight 20% reduction on mobs? Thus they should be hitting for less? In terms of Vindication 'damaging' the opponent there is a problem due to the order of effects. First the damaging attack damages the mob, then Vindication procs. If the amount Vindication reduces the mobs HP's by is less than the damage of the attack which proc'd it the net effect of Vindication is zero. Only if the HP reduction due to Vindication is greater than the damage caused by the attacks which preceded the proc, such as on Elite mobs with 15k+ HP, does Vindication have any real net effect on the Mobs HP. From a mob damage output POV, while the mobs will be hitting for a little less it won't be even close to 20% less damage as most mob stats are from raw AP/Crit rather than Strength and Agility. And frankly, in your gear you'll kill them so quickly that it won't make a great deal of difference. Vindication + Divine Storm or Holy Wrath (and perhaps Consecration) can be great on large packs of mobs in instances, but it's not too helpful for levelling. That said, there's not a huge amount of alternative talents to invest the points in I guess. I think that explains it. If it doesn't then it's probably worth me making a blog post about it ;).